Maints Corp. established the new appliance brand, ‘MAINTS’. This is a kind of ‘Design Project’ which is creating the products providing people’s lifestyle with new value, it’s also a ‘Technology Project’. The first product, ’PIROUETTE’, will be released on 15th June. It adopted the unique function that rotates continuously instead of an ordinary one swinging within range of mobility. Definitely it’s possible to choose the swing. Therefore each user is able to select the suitable ventilation due to setting the range freely. Further, the control of power, speed of wind and range of swing with ‘double sensor ring’ is possible. There are 2 push slide sensor rings on the external and internal sides. Actually, the inside sensor controls power and speed, while swinging range relies on another sensor. To add more, you can choose where the fan ventilates using sensor ring so that an area apart from setting range swings faster. It’s possible to adjust the range of swing in accordance to how many people there are. 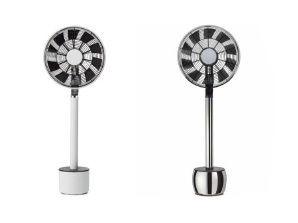 This fan would eventually gives natural and fresh wind with original wings and DC monitor. This can fit in with a diversity of living spaces and dairy life. The premium model that craftsmanship is made full use of is also released. The metal working in Tsubame City, Niigata is utilized for the notable shape and quality, ergo grinding stainless steel creates the dignified feature. Anyway the size of this is 340-180-900 mm, 5.4 kg is weighed. It costs 54,000 yen. What is ‘Wide FM’ which can be used by the latest CD-radio-cassette player by Panasonic? Who rescued a baby? ―it’s an amazing story that Siri help human’s life― The slim USB drive which is compatible with iPhone is released by SanDisk at last!! This iPhone case which increases at 128GB by Sandisk is must for those who worry about iPhone’s capacity! The top five ‘High-Quality Bluetooth Headphones’ recommended by the audio-visual critic The handy size of Fami-Com, ‘Nintendo Classic Mini’, is on sale, which contains of 30 Fami-com games How to Make The Kelp Tea Easily Candies and snacks perfect for souvenirs of Japan!